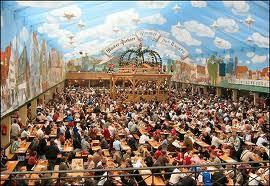 Today is the end of the 2012 Oktoberfest in Munich Germany, in the province of Bavaria, a province known for beer. 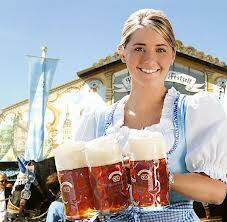 I wanted to do a German Oktoberfest beer but could not find any on the shelves of the LCBO. Instead I decided instead on a German beer from Hacker Pschorr, a brewery that has taken part in every Oktoberfest since the very first one in 1810 to celebrate the marriage of Ludwig I who was then the Crown prince of Bavaria. So instead of doing an Oktoberfest beer, I will be doing a Weisse beer from Hacker Pschorr, one they are quite well known for. As I said earlier, Okoberfest started in 1810 but the brewery's history goes back much further than that, to 1417. It was in 1793 that a change started in the brewery when Josef Pschorr married the Hacker Brewery daughter, Therese Hacker, and then bought the brewery from his new father-in-law and grew it into a very large brewery. Not entirely happy with the expansion of his brewery, he bought a second one in 1820. Before Josef passed away, he had a mini lottery to determine which son would inherit which brewery. Matthias inherited "Hacker" and Georg took "Pschorr". They shared the beer fortress. It took 'til 1972 for the two breweries to finally be merged together as Hacker Pschorr. Interesting that it is Georg whose face is on the label, which is a combination of both breweries labels. I wonder how that came to be? A nice touch is that the red circle which surround the "P" on the label is supposed to represent Josef's unending love for Therese. 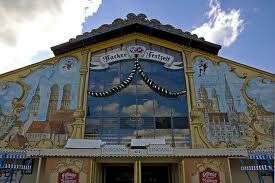 The Hacker Pschorr beer tent is a place I want to visit at Oktoberfest one day. It is one of the largest at the festival with seating for 10,000 people. Definitely on my "to do" list. The beer pours a cloudy deep yellow/golden colour with a white head. It's a very lively beer! The head sprang up instantly when I poured and stayed a long while, leaving behind thick lacings as it dissipated. Later when I went to top up, the head tried to take over again. There is lot's of banana in the aroma. My first sensation when sipping is a instant flavour on my tongue is a combination of many fresh flavours plus a slight heavy banana flavour throughout. This is a heavier, more full tasting Weisse than I am used to having. Weisse lovers would really enjoy this. Myself, I prefer lighter tasting Weisse beers. I am enjoying this and am glad I tried it but would not buy another. Tasting the quality in this makes me really want to try their Oktoberfest beer!